"One of the key features of volatility is that it is persistent, or “clusters”. High volatility over the recent past tends to be followed by high volatility in the near future. This observation underpins Engle’s (1982) pioneering work on ARCH models. In this paper, we study the risk and return characteristics of assets and portfolios that are designed to counter the fluctuations in volatility. We achieve this by leveraging the portfolio at times of low volatility, and scaling down at times of high volatility. Effectively the portfolio is targeting a constant level of volatility, rather than a constant level of notional exposure. While most of the research has concentrated on equity markets, we investigate the impact of volatility targeting across more than 60 assets, with daily data beginning as early as 1926. We find that Sharpe ratios are higher with volatility scaling for risk assets (equities and credit), as well as for portfolios that have a substantial allocation to these risk assets, such as a balanced (60-40 equity-bond) portfolio and a risk parity (equity-bond-credit-commodity) portfolio. Risk assets exhibit a so-called leverage effect, i.e., a negative relation between returns and volatility, and so volatility scaling effectively introduces some momentum into strategies. That is, in periods of negative returns, volatility often increases, causing positions to be reduced, which is in the same direction as what one would expect from a time-series momentum strategy. Historically such a momentum strategy has performed well. For other assets, such as bonds, currencies, and commodities, volatility scaling has a negligible effect on realized Sharpe ratios. We show that volatility targeting consistently reduces the likelihood of extreme returns (and the volatility of volatility) across our 60+ assets. Under reasonable investor preferences, a thinner left tail is much preferred (for a given Sharpe ratio). Volatility targeting also reduces the maximum drawdowns for both the balanced and risk parity portfolio. In Figure 3, we further compare unscaled and volatility-scaled returns, where the latter uses a volatility estimate based on a half-life of 20 days. 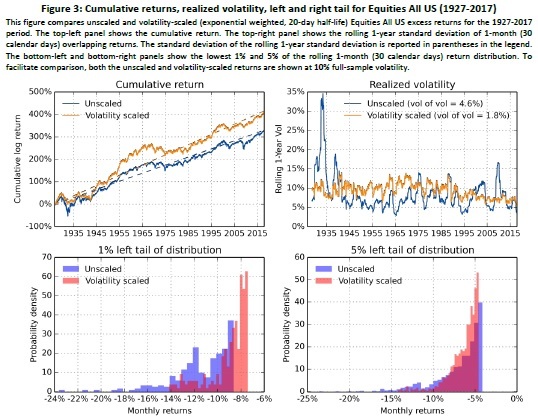 In the top-left panel, we plot the cumulative return, which shows that the volatility-scaled investment generally outperformed, except during the middle part of the sample period. The impact of volatility scaling is illustrated in the top-right panel, where we depict the rolling 1-year realized volatility for both unscaled and volatility-scaled 30-day overlapping returns. The realized volatility of volatility-scaled returns is much more stable over time. This is also evident from the vol of vol metric (i.e., the standard deviation of the rolling 1-year realized volatility) reported in the legend: 4.6% for unscaled returns versus 1.8% for volatility-scaled returns. Finally, in the bottom-left and bottom-right panels we show the lowest 1% and 5% of the 1-month (30-calendar days) return distribution.19 Very negative returns of, say, -10% or worse are more common for unscaled returns. To summarize, Figure 3 illustrates the two main ways volatility scaling has helped an Equities All US investment: first, it improves the risk-adjusted performance, and second, it reduces the left tail. Initial coin offerings (ICOs), sales of cryptocurrency tokens to the general public, have recently been used as a source of crowdfunding for startups in the technology and blockchain industries. We create a dataset on 4,003 executed and planned ICOs, which raised a total of $12 billion in capital, nearly all since January 2017. 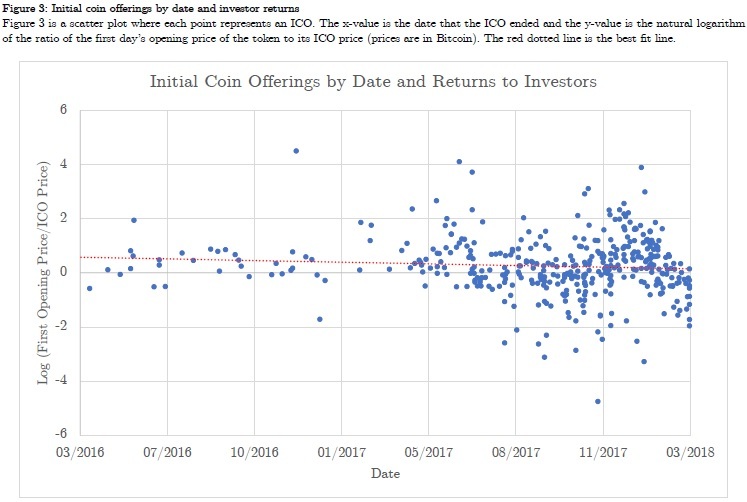 We find evidence of significant ICO underpricing, with average returns of 179% from the ICO price to the first day’s opening market price, over a holding period that averages just 16 days. Even after imputing returns of -100% to ICOs that don’t list their tokens within 60 days and adjusting for the returns of the asset class, the representative ICO investor earns 82%. After trading begins, tokens continue to appreciate in price, generating average buy-and-hold abnormal returns of 48% in the first 30 trading days. We also study the determinants of ICO underpricing and relate cryptocurrency prices to Twitter followers and activity. While our results could be an indication of bubbles, they are also consistent with high compensation for risk for investing in unproven pre-revenue platforms through unregulated offerings. "The traditional sources for seed and early-stage funding have recently been supplemented with crowdfunding: raising money from many small investors, in small amounts, over the Internet. Early on, crowdfunding was provided in exchange for future rewards or deals on products (e.g., Indiegogo, Kickstarter), and more recently for securities (equity crowdfunding). Advances in the blockchain technology have also led to a new hybrid form of crowdfunding: token offerings, also known as initial coin offerings (ICOs), which are the subject of this paper. Tokens are cryptocurrencies, digital currencies for which all records and transaction data are protected by cryptographic methods. Entrepreneurs issue branded tokens to raise capital to create an online platform or ecosystem, in which all transactions require the use of that native token. In the 16 months since January 2017, over 1,000 startups successfully raised a total of about $12 billion using ICOs. The closest analogue to the ICO is the Initial Public Offering (IPO) of equity. In addition to selling a different asset, two key differences between ICOs and IPOs are: (1) ICO firms are much younger and smaller, typically in the earliest stage of a firm’s life cycle, and (2) ICO firms do not use an underwriter to help determine value and attract buyers. As a result, it is not clear how two well-known characteristics of the IPO market, underpricing and post-IPO underperformance translate to ICOs and listed tokens. In this paper, we study the market for crypto-tokens, focusing on how entrepreneurs determine the price for tokens, the returns to investors from buying tokens during an ICO and selling them once they are listed on an exchange, and the returns to investors from investing in tokens on the listing date and holding them for various fixed time horizons. We also use data from Twitter accounts of cryptocurrency firms to investigate the relationship between Twitter followers and activity, and market prices, and to measure the attrition rate of crypto-companies after completion of the ICO. Our paper aims to provide a comprehensive analysis of how startups in this industry transition and perform from birth, through the offering, to the listing, and beyond. Figure 3 illustrates that most tokens were sold below their market price, but also, that many tokens were overpriced, and declined in value. The red-dashed line, which is the best fit line, is above the x-axis for the entire sample period, indicating that the average (log) return is positive, but it has a negative slope, suggesting that underpricing of tokens has declined over time (i.e., returns to ICO investors have been declining). Table 3 shows the average returns to investing in an ICO. We start by calculating returns to investors in 416 ICOs that went on to list, in less than 60 days, and report the results in Column (1) of Table 3. The average of equal weighted returns to investing in listed ICOs is a statistically significant 179% and 167% (in Bitcoin), with a very similar 173% and 162% (in Bitcoin) value-weighted average. From the sellers’ point of view, crypto-companies are, on average, issuing tokens for less than half of their true market value, leaving significant money on the table. For Columns (2) and (3), we also include (in addition to the 416 listed ICOs) another 471 ICOs that reported raising capital but did not list within 60 days. Since there are no available market values for these tokens in the aftermath of the ICO, we impute returns under two different scenarios. In Column (2), the average imputed return to unlisted tokens is -50%. Unlisted tokens investments are not a total loss if the raised capital is refunded due to inadequate funds, if there is an over-the-counter market for them, or if the tokens are listed on an exchange which is not included in CMC. 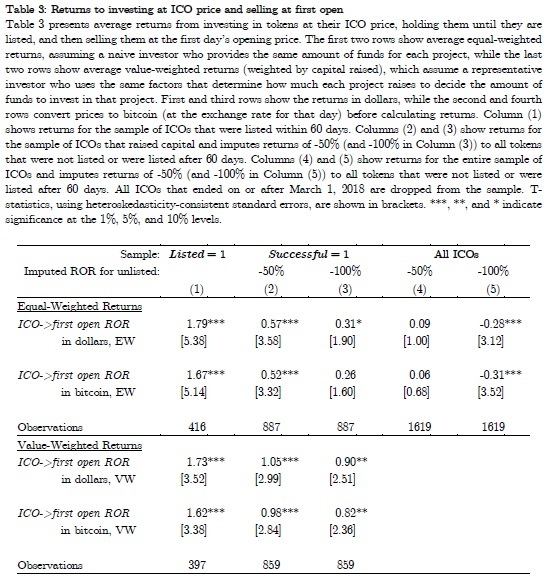 With imputed returns of -50% to unlisted ICOs, average ICO returns are unsurprisingly lower than in Column (1), 57% and 52% (in Bitcoin) for equal-weighted averages and 105% and 98% (in Bitcoin) for value-weighted averages, but still positive and statistically significant. In Column (3), we look at worst-case scenario, imputing -100% to all ICOs that raised capital but did not list within 60 days. Under this scenario, the equal-weighted average returns are 31% and 26% (in Bitcoin) and are no longer significant at the 5% level, but the value-weighted returns remain larger in magnitude and significant at 90% and 82% (in Bitcoin). For Columns (4) and (5), we include an additional 732 ICOs that neither reported raising capital nor were listed within 60 days. Again, we calculate and report average equal-weighted investor returns after imputing -50% (in Column (4)) and -100% (in Column (5)) returns to unlisted ICOs. Since these ICOs raised little or no capital, they do not change the value-weighted returns we calculated and displayed in the last two rows of Columns (2) and (3). When including these ICOs, equal-weighted returns are reduced to 9% (6% in Bitcoin) with a -50% imputed return, and -28% (-31% in Bitcoin) with an imputed return of -100%. These are the returns to a naïve investor who invests across all ICOs, even those that didn’t report raising capital, and they provide a lower bound to naïve investor returns. However, they are not at all a realistic estimate of returns, even for naïve investors, because many of the ICOs that don’t report raising capital (and many of those that report raising capital but do not list) either refunded the capital they raised because of inadequate funds or they planned an ICO but never actually began collecting funds. Title: What is the Optimal Significance Level for Investment Strategies? Most papers in the financial literature estimate the p-value associated with an investment strategy, without reporting the power of the test used to make that discovery. This is a mistake, because a particularly low false positive rate (Type I error) may be achieved at the expense of missing a large proportion of the investment opportunities (Type II error). 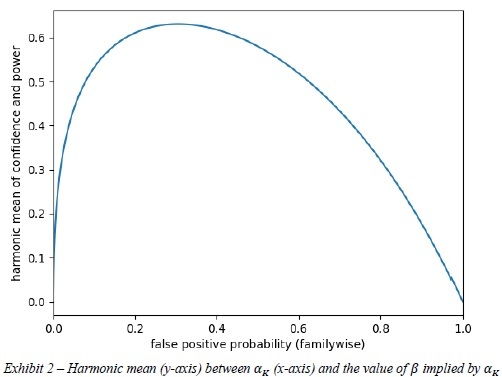 In this paper we provide analytic estimates to Type I and Type II errors in the context of investments, and derive the familywise significance level that optimizes the performance of hypothesis tests under general assumptions. Contrary to long-held beliefs, we conclude that a familywise significance level below 15% is suboptimal (excessively conservative) in the context of most investment strategies. "Financial researchers conduct thousands (if not millions) of backtests before identifying an investment strategy. Hedge funds interview hundreds of portfolio managers before filling a position. Asset allocators interview thousands of asset managers before building a template portfolio with those candidates that exceed some statistical criteria. What all these examples have in common is that statistical tests are applied multiple times. When the rejection threshold is not adjusted for the number of trials (the number of times the test has been administered), false positives (Type I errors) occur with a probability higher than expected. Empirical studies in economics and finance often fail to report the power of the test used to make a particular discovery. Without that information, readers cannot assess the rate at which false negatives occur (Type II errors). Suppose that you are a senior researcher at the Federal Reserve Board of Governors, and you are tasked with testing the hypothesis that stock prices are in a bubble. At first, you apply a high significance level, because before making a claim that might trigger draconian monetary policy actions you want to be extremely confident. At a 99% confidence level, you cannot reject the null hypothesis that stock prices are not in a bubble. When you report your findings to the Board, the chairperson asks what is the power of the test. Surprised by the unexpected request, you promise that you will report the test’s true positive probability in the next meeting. Back at your office, you are shocked to realize that, unbeknownst to you, the test’s power is only 50%. In other words, the test is so conservative that it misses half of the bubbles. At the next meeting, the chairperson shakes his head while explaining that, from the Fed’s perspective, missing half of the bubbles is much worse than taking a 1% risk of triggering a false alarm. In contrast, hedge funds are often more concerned with false positives than with false negatives. Client redemptions are more likely to be caused by the former than the latter. Also, investors know that performance fees incentivize managers to avoid false negatives, hence a “safety first” principle calls for investors to focus on avoiding false investment strategies. Although this is a valid argument, it is unclear why investors and hedge funds would apply arbitrary significance levels, such as 10% or 5% or 1%. Rather, an objective significance level could be set such that Type I and Type II errors are jointly minimized. In other words, even researchers who do not particularly care for Type II errors could compute them as a way to introduce objectivity to an otherwise subjective choice of significance level. The purpose of this paper is threefold: First, we provide an analytic estimate to the probability of selecting a false investment strategy, corrected for multiple testing. Second, we provide an analytic estimate to the probability of missing a true investment strategy, corrected for multiple testing. Third, we derive the significance level that maximizes the performance of a statistical test used to detect investment strategies. WHAT IS A REASONABLE SIGNIFICANCE LEVEL FOR INVESTMENT STRATEGIES? For the particular numerical example presented earlier, where 𝑧𝛼≈2.4978 and the true Sharpe ratio was assumed to be 𝑆𝑅∗≈0.0632 (annualized Sharpe ratio of 1.0), the harmonic mean between confidence and power is maximized at 𝛼𝐾∗ ≈0.3051 and 𝛽≈0.4224, where ℎ≈0.6309. Exhibit 2 plots ℎ (y-axis) as a function of 𝛼𝐾 (x-axis). The reader may be surprised to learn that the optimal significance level is so high, compared to the standard 5% false positive rate used throughout the academic literature. 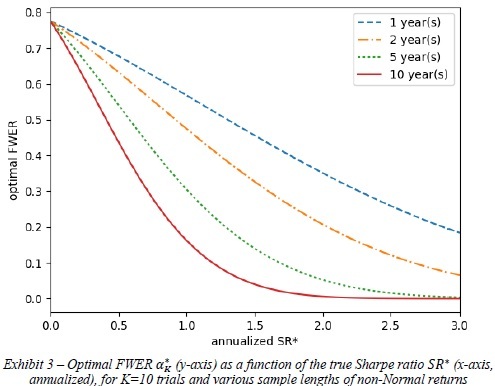 The reason is, at the standard significance level of 𝛼𝐾=0.05, the test is so powerless that it misses over 71.55% of strategies with a true Sharpe ratio below 1! It is therefore optimal to give up some confidence in exchange for more power, even if that means accepting a false positive rate as high as 30.51%. Similarly, we can compute the optimal FWER 𝛼𝐾∗ under alternative assumptions of 𝑆𝑅∗. Exhibit 3 plots the optimal 𝛼𝐾∗ (y-axis) under various 𝑆𝑅∗ values (x-axis) and sample lengths (different lines) for the same numerical example, where 𝑆𝑅̂=0.0791, 𝐾=10, skewness is -3 and kurtosis is 10. The implication is that, unless you are researching a strategy with a true annualized Sharpe ratio above 1 over a period of more than 10 years of daily data, a FWER below 15% is likely to be excessively conservative.